KPBSD teens, will you be 18 by June 30, 2017? 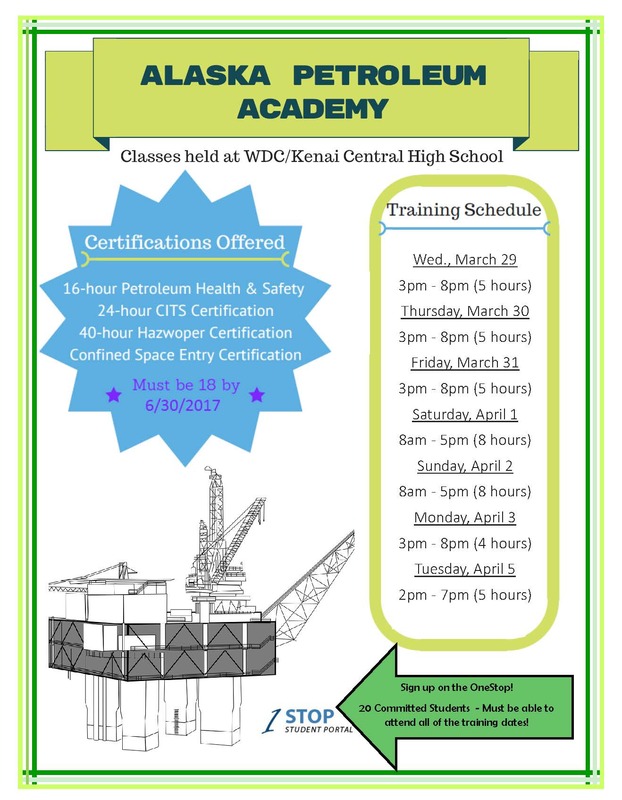 You have the opportunity to earn industry certifications in Kenai, from The Alaska Petroleum Academy. Classes will be held at the Work Force Development Center~Kenai Central High School, and are open to all KPBSD teens. Requirements: students must be 18 by June 30, 2017, and be able to attend all training dates. The program only allows 20 students to attend and if more sign up an interview process will be held. Tags: CITS, CTE, Hazwoper, The Alaska Petroleum Academy. This entry was posted on March 9, 2017 at 4:59 pm. You can follow any responses to this entry through the RSS 2.0 feed. You can skip to the end and leave a response. Pinging is currently not allowed.